Like the School in which it's housed, the MIME Machining and Product Realization Laboratory (MPRL) has two overarching goals: to educate engineering students, and to support and facilitate research. And under the visionary oversight of MPRL manager Brian Jensen – and before him, of the late Steve Adams – the facility does an outstanding job of fulfilling both commitments. In its instructional capacity, the MPRL plays a central role in MIME students’ hands-on education, arguably providing the singlemost important programmatic contribution to their preparation as truly work-ready graduates. “Learning how to use the lab and its equipment is an integral part of our undergraduate curriculum,” says MIME interim school head Rob Stone. “Certification in safe and proper use of the equipment is a prerequisite for our junior year Introduction to Design class, so by the time they start pro-school, all of our mechanical and manufacturing engineering majors, and quite a few of our IEs as well, know how to use the equipment in here. In 2011, Brian Jensen (BSME 1999, MSME 2006) left his job at the Idaho National Laboratory to step into the role of MPRL manager after the untimely death of Steve Adams, whose legendary passion for the hands-on side of engineering education – and for helping students make the important connections between engineering theory and practice – is something Jensen experienced first-hand during his own student years at OSU. He offered the following information in response to questions about his history with the lab, the mentoring he received from Adams, and what prompted his decision to return to MIME. “I have a pretty long history with the MPRL. My involvement began as an undergrad when I was hired by Steve Adams as one of his work-study students in what was then known as the ME Machine Shop. I was involved with the SAE Baja team at the time and wanted to get more time on the equipment myself so that I could manufacture parts for the car. “As a student, my experience with the shop was much the same as others, in that it provided a place where I could learn by experience (or more correctly by experiencing failure). In my opinion, one of Steve's greatest attributes was that he provided opportunity. Students could do as little or as much as they wanted in the MPRL environment. It was really up to them to decide how much they wanted to learn and much they wanted to improve their skills. The engineering students who spent a lot of time in the shop quickly learned how the theories of engineering science they learned in their core classes physically manifest themselves as they attempted to make parts. Machining labs are a staple of most top-echelon engineering programs, but compared to its counterparts at other institutions, what sets the MPRL apart is its extraordinarily high level of student access. In addition to its regular 40-hour-a-week operations, the MPRL offers extended hours to students whenever the need arises, most typically as terms wind down and class projects become due. Any student (or faculty member, for that matter) who has completed the requisite certification is welcome and encouraged to use the MPRL for their projects. And whenever the MPRL doors are open, lab staff make a point of being on hand for consultation and assistance. Kirkpatrick, whose engineering interests are focused on the thermal–fluid sciences, is only one of many MIME students who have found employment in the lab over the years. In fact, the majority of MPRL staff members comprise GRAs, GTAs, and undergraduate assistants. These students are gaining not only expertise in lab equipment use but also invaluable opportunities to witness – and emulate – the mentoring and collaborative practices for which OSU faculty are so widely renowned. Along with a host of other machining devices, the MPRL is equipped with a wide range of CNC machines, allowing fabrication of items ranging from micro-scale devices to transmission housings for the SAE vehicles. In addition, several fused deposition modeling machines allow researchers to quickly prototype new conceptual designs. Which brings us to the lab's second function: supporting university-wide research. Along with their teaching roles, MPRL staff are frequently commissioned to design and fabricate custom parts and components needed by faculty and graduate researchers throughout OSU, including not only engineers but also chemists, oceanic scientists, agriculturalists, health and human performance specialists, and more. This work is an important source of funding that helps keep the facility in operation; and, as Jensen noted, the lab has a campus-wide reputation for producing superior products at competitive prices. Recent commissions have included titanium instrument flanges for vessels use to collect ocean water data, fixtures for material property and fatigue testing, masks used for vacuum deposition processes, and custom fixtures for measuring radiation levels of materials in a vacuum chamber for chemistry. 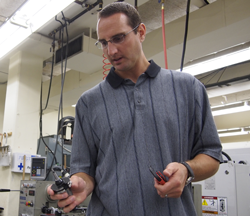 In 2008, an MPRL expansion spearheaded by Adams more than tripled the lab's size and numbers of lathes, mills, and other equipment holdings in order to continue the growing numbers of MIME students in basic manufacturing skills. But with record-breaking increases in student enrollment and university research activity over the past five years, there is a now a strong need for further lab expansion, and fundraising efforts for another round of facilities upgrades are currently underway. The planned space and equipment upgrades not only will better serve MIME students; they will also expand the range of prototyping services available to OSU researchers. If you are interested in supporting this renovation project, please consider making a gift to the MIME Excellence Fund.